At Building Faith we believe that children are welcome members of the worshipping community. When children are present at existing ‘adult’ worship services, they often grasp far more than we may think. That being said, when it comes to Holy Week, children can benefit greatly from worship experiences that are specifically crafted for them. 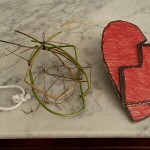 In terms of teaching about Holy Week, adults can also help children by using language and concepts that meet them where they are. 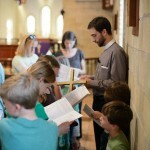 Over the years, Building Faith has published many articles about Holy Week with children. Here are some of our favorites. From talking points about the cross, to foot washing, to song suggestions, you are sure to find something that will help you guide our youngest Christians through Jesus’ last days. Longtime Christian educator, Dr. Elizabeth Windsor, offers talking points and approaches for discussing Holy Week with children. Whether you are leading a Sunday school class or constructing a sermon, you will find this wisdom invaluable. For example, one of the most important things to remind children is that Jesus did not die alone. Matthew Kozlowski describes the basics of a stations of the cross service that involves children throughout. He gives reasons for why children can benefit from a stations service, as well as practical tips for carrying it out. Carolyn Brown offers a version of the Tenebrae service that works especially well for children and intergenerational groups. Rather than using candles, she offers a clever twist to include props and movement. The passion story comes alive as the scriptures are read and participants cover objects with black cloths, until the service concludes in darkness. 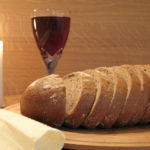 Elizabeth Ewing describes an evening Maundy Thursday event which welcomes children and families. Instead of remaining in one place, participants move through three stations as they experience the fullness of the Holy Week narrative. Part 1 is a last supper meal and communion. Part 2 allows everyone to trace their feet on a cloth. Part 3 is a traditional foot washing. The evening concludes in prayer and silence. 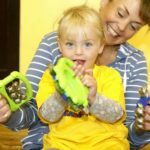 Fiona Vidal-White, an experienced Christian educator and music minister, offers her suggestions for songs and hymns that work well with children and multi-age groups. Drawing from a variety of published worship books, she offers a set of options for every service of Holy Week and Easter. a bit too much for me for a 25 year old paperback. Can you help?